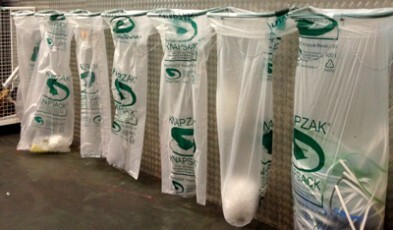 PRM Waste Systems are proud to be the UK agent for Knapzak from the Netherlands. Knapzak is designed to ensure you collect and separate waste quickly and easily in any environment; including manufacturing, retail or distribution. The Knapzak system is designed for the efficient collection and segregation of materials such as plastic packaging, foil, EPS, PE and PET bottles, as well as cardboard and general waste. The Knapzak is designed and positioned within organisations to segregate to a very high standard, as well as at speed. The system will maximise the return on the most valuable of waste streams whilst reducing contamination by others. The Knapzak range is both broad and extensive and has its place in both the small confined area, as well as being palletised for the vast distribution operations that it often finds itself utilised. Take a look at the Knapzak movie to see how the Knapzak system could work for you.